Every week one child from each class is sent to Mrs Stewart-Smith for positive contact. Positive Contact is one of the most prestigious awards that children can receive at Farley. 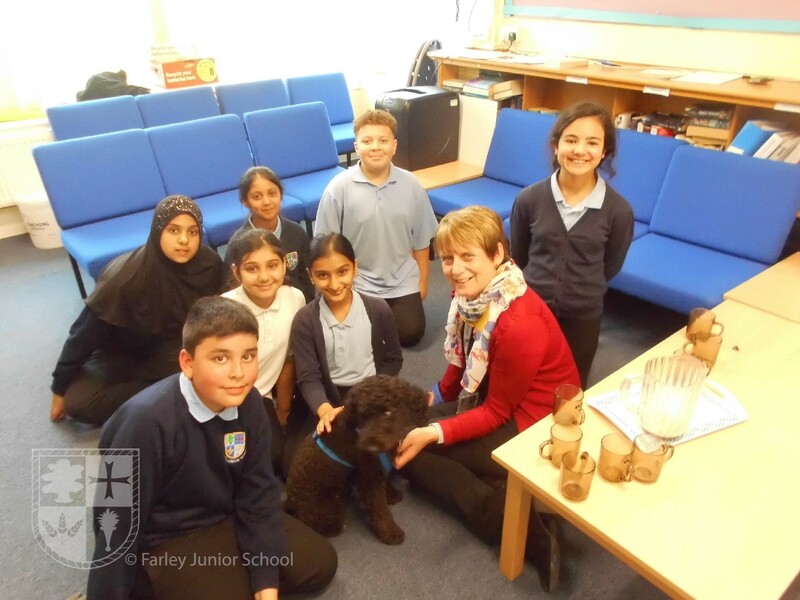 Whilst each child with Mrs Stewart-Smith, they get to meet Hamish (our school dog) and have a hot chocolate. The reward is given in recognition for each child's great learning behaviour. During their time with Mrs Stewart-Smith and Hamish, all of the children explain why they have been sent to the special event. This is one of the most popular times of the week for children in Farley Junior School. Each week 5 children from each class are awarded a positive note for their hard work or positive attitude throughout the week. 1 child is also awarded the Positive Contact, meaning their parents will be contacted by the class teacher to let them know how great their child has been this week. Each week staff can nominate children who have showed a school, they will then be aware a value badge in Fridays assembly. 3A Aiden Mrs Badesha and Mrs Ibrahim Aiden is always a responsible role model to his peers, ensuring that he is taking responsibility for his own learning by asking questions and explaining his reasoning. When working in a group, Aiden is able to take responsibility as a leader and listen to ways to support his group to get better. 3B Amaya Miss McLaren Amaya has shown a great amount of responsibility for her learning this week, as she has worked to the best of her ability and it has paid off. She has also has supported her peers in a range of different ways to help them achieve the best they can in different lessons. Thank you for your help Amaya! 3C Hasan Miss Ahmed Hasan has been been very responsible this week with his learning. He has taken responsibility for his learning by getting on with all tasks set straight away and managing distractions at the same time. Keep it up Hasan. 4A Aiza Miss Gandre Aiza has shown that she is a responsible learner this week in maths: when she was stuck, she asked for support asking both her learning partner and her teacher to make sure she understood the work and could complete it. Well done for your hard work and effort in lessons, Aiza. Keep it up! 4B Neha Mrs Maycock Neha is the Queen of responsible. Every morning Neha arrives to school early and sets up the clasroom for everyone. Everything is always perfectly set out neatly and in order.Thank you so much Neha. 4C Zara Mrs Ayres and Mrs Davies Zara always completes her work to the best of her ability and is one of the first children to begin her work without a fuss. Zara is always willing to extend and add to her work so that it is of high quality. She is always ready to help others in need. Thank you. 5A Laaibah Mr Gayle Miss Nessa Laaibah has been very responsible in our class she uses her initiative to help hand out and collect learnig resources in the class. She also supports her table by helping to tidy up and ensuring that things are in order. Laaibah has grown in confidence since assuming this role . Well done. 5B Shivam Ms Mustarde Shivam always take great responsibility for his learning. He makes a real effort and listens to instructions, takes on board advice and is able to improve his work as a result. Shiuvam this is excellent, make sure that you apply the same level of responsibility when outside of the class room too please and you will be a model pupil. well done. 5C Farhan Mrs Hairon Farhan has made an excellent start to the summer term. It has been great to see him focus, work hard and take responsibility for his learning. Keep it up Farhan. 6A Sohaib Miss Coward + Miss Coley Sohaib has made a huge effort over the last few school weeks to take responsibility for his behaviour choices. He is becomming an amazing scholar. It has also been wonderful to see Sohaib to more responsibility for his learning by asking for help when needed and always trying his best. Well done Sohaib. 6B Arzoo Mrs Thomas-Sloley Yesterday, I watched Arzoo intervene with her learning partner. He was calculating long division and he'd made a mistake. Arzoo took the responsibility to calmly and sensitively tell him where he had gone wrong and help him to complete the calculation without giving him the answer proving she has a great grasp of long division, but also that she has a great sense of responsibility for others. Thank you Arzoo. 6C Zain Zain has found long division challenging. He has taken responsibility for his own learning, giving up his play time too, and asked for help. He knows he still has work to do and is taking this responsibility seriously, working hard to learn the method of long division. Well done Zain, I'm proud of you.